Can Seagate escape coming HDD crash? Analysis The flash industry is worth more than twice the disk drive industry in terms of product ship revenues. Trends suggest a shrinking disk drive industry will squeeze the three drive manufacturers, leaving Seagate with no escape. Storage sector analyst Aaron Rakers has run supplier numbers through his spreadsheets and reckons the flash industry revenue is growing at 55 per cent a year while the disk drive business is shrinking 5 per cent a year. 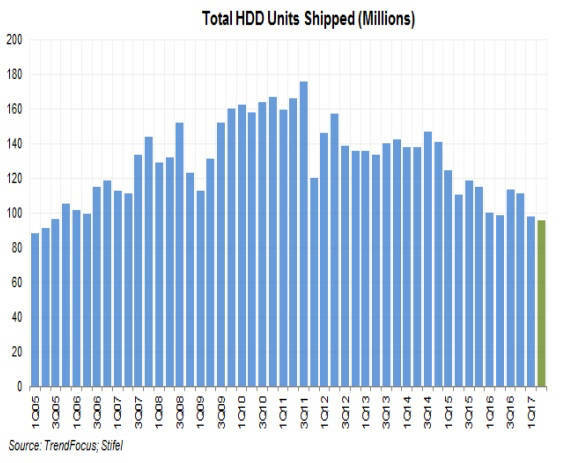 A total of 95.8 million disk drives were shipped in the second 2017 quarter, 3 per cent lower than the previous quarter and the year-ago quarter. Rakers has graphed the quarterly ship numbers to show a pattern of decline from a high point in 2011, six years ago. 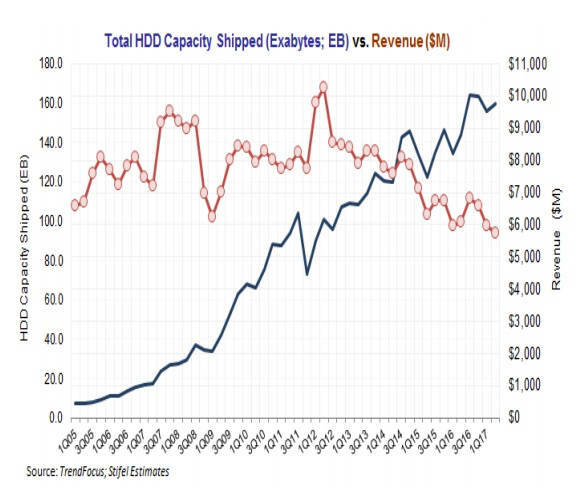 The amount of disk drive capacity shipped is still rising while both unit and revenue slips. The growth sector in disk drives is for high-capacity enterprise drives, nearline disks, with both capacity and revenue rising overall. WD is the frontrunner, Seagate second and Toshiba a distant third. In the flash industry Rakers looks at Samsung, SK Hynix, Intel, Micron and WD as the main vendors. He thinks Samsung's revenue share is about 35 per cent, and WD's is around 17-18 per cent. NAND capacity shipped in the second quarter, including for phones and other smart devices (some 40 per cent if capacity shipped), and enterprise storage, was about 35 exabytes. The total HDD capacity shipped number was 159.5 exabytes, almost five times larger, with some 58 exabytes constituting nearline/high-capacity enterprise disk drives. The latest flash industry tech advances are taking place in 3D layering, with a general 64-layer to 96-layer transition looming, leading to lower per-bit costs, and in the bits/cell area. Here 4bits/cell (QLC) technology is being prototyped and tested, and this, with a third more bits/cell than current TLC (3bits/cell) will also lead to lower per-bit costs. The combined effect will be to move the boundary between SSD and HDD use further into the disk drive area towards nearline and high-capacity drives. The only way for the disk drive vendors to lower their cost/bit and preserve a price gap is to increase areal density by adopting shingled (slower write-performing media) and HAMR (Heat-Assisted Magnetic Recording) and so drive to 20-30TB drives. WD can face a faster transition from disk drives to SSDS with equanimity; it has a significant NAND chip and significant SDD business. Seagate can not; it having no NAND chip and a minor SSD business. The disk drive industry, as a major storage media player, is heading towards a head crash and Seagate has no escape strategy. Toshiba can also face the transition with little concern, as it has a minor disk drive business and significant flash chip and SSD businesses. Seagate might be hoping that it will have a profitable disk drive business for several years ahead because both Toshiba and WD will focus more on their profitable and growing flash chip/SSD businesses and less so on disk drives. Indeed troubled Toshiba might even exit the disk drive business. Longer term, Seagate strategists must expect flash chip foundry capacity to increase, sending cost/flash bit downwards, and squeezing the disk drive industry between SSDs for for fast access storage and tape drives for the cheapest-possible on-line storage. What are they telling Seagate's senior execs and what are those execs thinking about Seagate's product strategy in the 5-15 year timeframe?